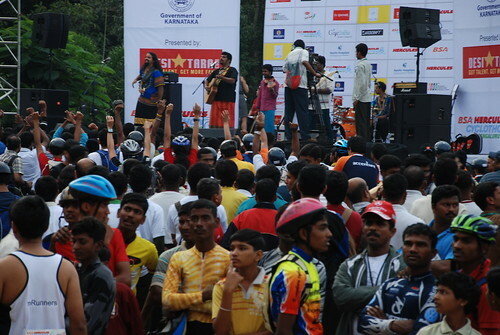 It was heartening to see thousands of cycling enthusiasts in Bangalore at India’s fist Cyclothon! 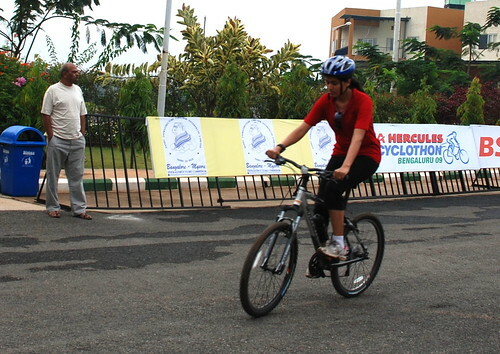 The sheer number and the diversity of the participants that spanned between Ages 8 – 80 years, along with families and friends who had come to cheer their loved ones set the excitement of the massive event. Raghu Dixit and his crew rock started the event with ‘Mysore se aayi woh’ – Pumped me up further as I am a native Mysorean 😀 My husband and I had a nice time swaying to his tunes before we set off on our respective rides. I did a satisfied 25Km in an hour and 5 minutes, with an average pace of 22.5 km/hr. The NICE corridor resembled any freeway in a western country – spotless, toned and smooth. Little children cheering on the pathways, green lawns next to the road, great weather and people riding great bikes were all accompaniments. The journey was eventful as I met some interesting people during the ride and was fun taking to them. 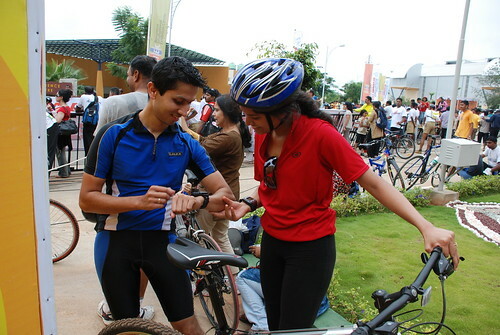 Since it wasn’t a race, the environment was relaxed and people were riding just for the spirit of cycling. Please click here to view the snapshots of the entire event.